The transfer deadline is over. Silly season has officially finished in English football (at least until the January transfer window opens). 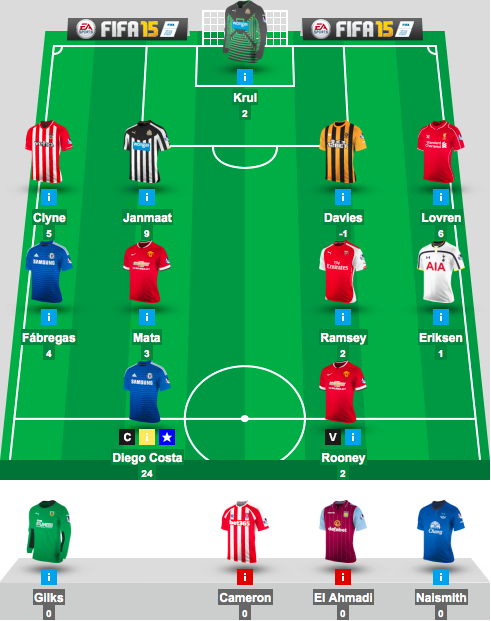 And the first three game weeks of DOOM's first official fantasy league have taken place. Only 9 more months to go before we crown a champion! So lets get our bearings, shall we? 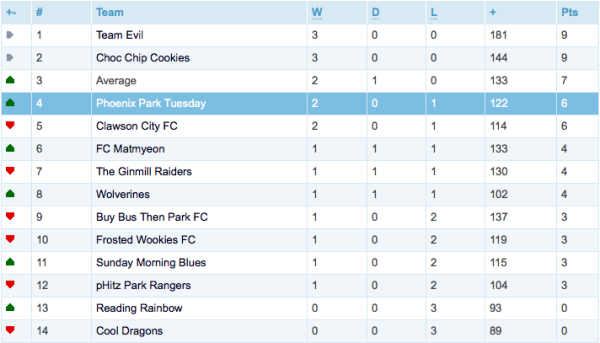 As it stands, here is our league table (yes, my team is highlighted, I haven't figured out how to get rid of that yet). As we speak, there are only two teams undefeated, and two teams without a win. Lets look at the positive and check out the top two. Choc Chip Cookies is managed by Fiona Hook (who hasn't designed her team jersey yet, tut tut). Here is how her team looks as of the most recent week. Some good choices there. Ramsey was a beast last season, Fabregas seems to be one of the buys of the season at Chelsea, and Henderson is a reliable performer at Liverpool at a good price. Now lets look at Team Evil (using an appropriate all black kit) with an amazing points tally of 181 so far, managed by Andrew Donaldson. Great choice of captain (that can make or break your team's performance), a surprisingly good investment in a Newcastle defender (who knew? ), and some familiar high performing faces. 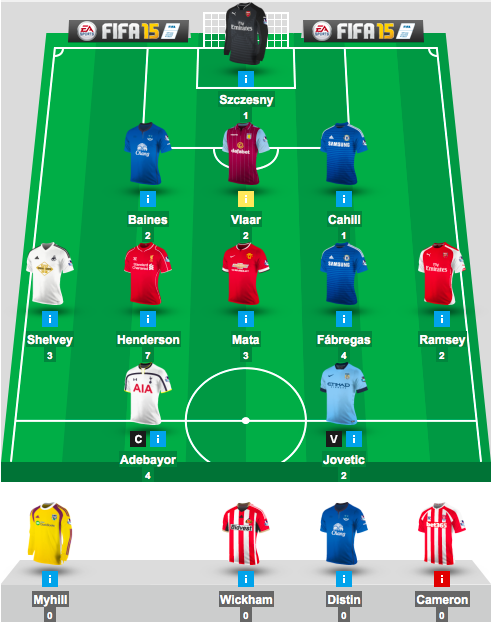 Interestingly, neither team has used their transfer wildcard yet (which allows you to make as many transfers as you want in one game week without points deductions). I, however, used mine after the second week. I did not choose wisely at the start of the season. I took some chances that didn't pay off. But I feel better about my team now and think it was worth blowing my wad early so to speak. I would suggest you do the same if you think you're under-performing so far. There is no point in waiting as you're just losing points in the mean time and you get another wildcard in January too so get your wheeler-dealer hat on and sort that team out! Every month I'm adding to The Prize Box. 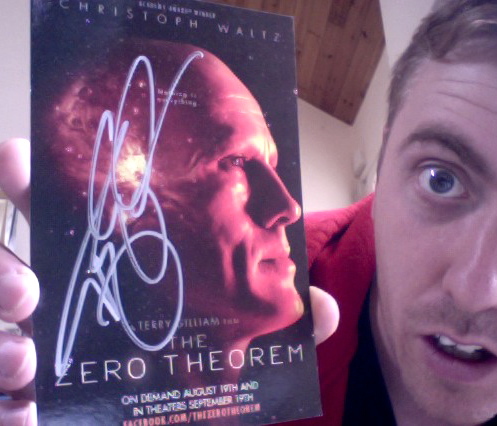 This month I'm throwing in (amongst some other weird crap) a postcard for the film The Zero Theorem, signed by its director Terry Gilliam! Here is a picture of me holding it to prove that it's real. There is plenty of time to go before the end of the season so don't worry if you're doing poorly so far. Just keep an eye out for a bargain buy and be clever with your captain choices! We'll see you again back here for next month's report.